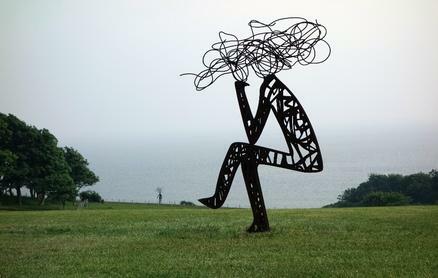 Two large-scale works from Nadim Karam’s Stretching Thoughts series were recently installed on the grounds of the UWC Atlantic College in south Wales. Standing (2015) and Sitting (2015) have been renamed Shepherd and Thinker in honour of their new sites along the pastoral coastline of the campus. The sculptures were first shown to the public last year at the Jing An Sculpture Park in Shanghai, where they were part of the city’s JISP Biennale. According to Karam’s Beirut-based Atelier Hapsitus, the two works explore ‘the human mind; its spread of ideas and its creative energy.’ Shepherd and Thinker now stand as reflections of the Welsh institution’s commitment to imaginative thinking and global citizenship.